Last Saturday, thousands of conservative, self-professed members of the "Tea Party" converged on the National Mall to attend a rally organized by Fox News pundit Glenn Beck. It was dubbed the Restoring Honor rally, and was allegedly an apolitical gathering--a tribute to our men and women in the armed forces and, perhaps unexpectedly to some, a call for religious revival in the United States. I must admit, I didn't attend the rally at all (though I did get to hang out with scores of Tea Partiers who were checking out the human evolution exhibit at the taxpayer-funded American Museum of Natural History later that day). Many Beck supporters reportedly camped out along the reflecting pool to secure a good spot for the event, and I just didn't have the heart to show that kind of commitment. But in hearing and reading about the rally in the days after, I'm left feeling very perplexed about the whole thing. What exactly was it for? 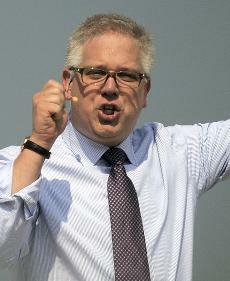 It's well accepted that the people who were there are ardent fans of Glenn Beck, and therefore have a vested interest in the political future of our country--namely to "bring it back to its conservative roots" (there's a ridiculously long list of why this concept is fallacious, but that's neither here nor there). But the speakers at the rally deliberately avoided striking a political tone, and instead focused largely on the concepts of "faith, hope, and charity," with a particular emphasis on religion. "Something that is beyond man is happening," Beck said. "America today begins to turn back to God." The rally, he said, "has nothing to do with politics. It has everything to do with God, turning our faith back to the values and principles that made us great." It was, in fact, the Founding Fathers of our country, the very group of intellectuals whom Beck constantly touts as the paradigms of perfection, who deliberately tried to retain a Constitutional wall between religion and civics. To keep one religious group from having the power to suppress or direct others in our country, Article 6 of the constitution, as well as the First Amendment, help to keep church and state completely separate. And while many were relatively observant Christians, the Founders knew that this was the right thing to do. "Religion is a matter which lies solely between man and his god, that he owes account to none other for his faith or his worship, that the legitimate powers of government reach actions only, and not opinions, I contemplate with sovereign reverence that act of the whole American people which declared that their "legislature" should "make no law respecting an establishment of religion, or prohibiting the free exercise thereof," thus building a wall of separation between church and State." In a complete contradiction of Jefferon's views, in his speech on Saturday, Beck disparaged President Obama's "version of Christianity." This is territory that the Founders were trying deliberately to avoid. Mr. Beck should take a page from the book of his hero Thomas Jefferson, and seek to engage in more honest intellectual debates, rather than stirring fear, manipulating the truth, and trying to infuse his religion, or any religion, into the very idea of America and what we stand for as a nation.